This page is dedicated to my old "dust-collector". 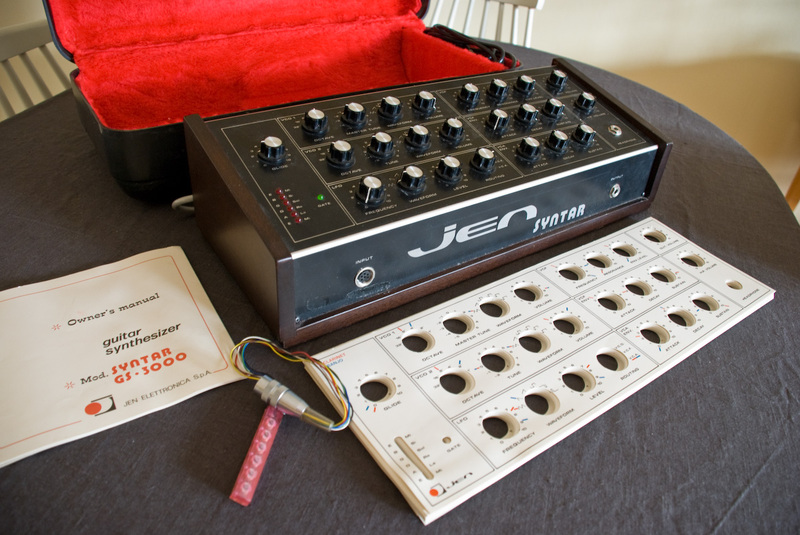 I have some free samples and information on this strange old synthesizer. I have decided to make a small hobby out of trying to get this rare old synth to respond to MIDI. All VCO waveforms are represented at all their "lengths". There are no multisamples since it is a guitar synth without either keyboard, midi or CV/Gate inputs. Only by short-circuiting the broken old guitar-pickup contraption am I able to trigger notes... pretty much at random. The samples were recorded through a JoeMeek preamp into ProTools. Trimmed and edited very slightly and then exported out to 16bit aiff. The samples are free for anyone to use as they like but please credit me in any commercial release... i.e. Creative Commons Attribution-Share Alike 2.5 (Sweden) License. Download the 21MB zip file. 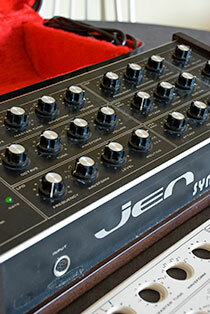 Simply put, it is a Minimoog rip-off for guitarists. 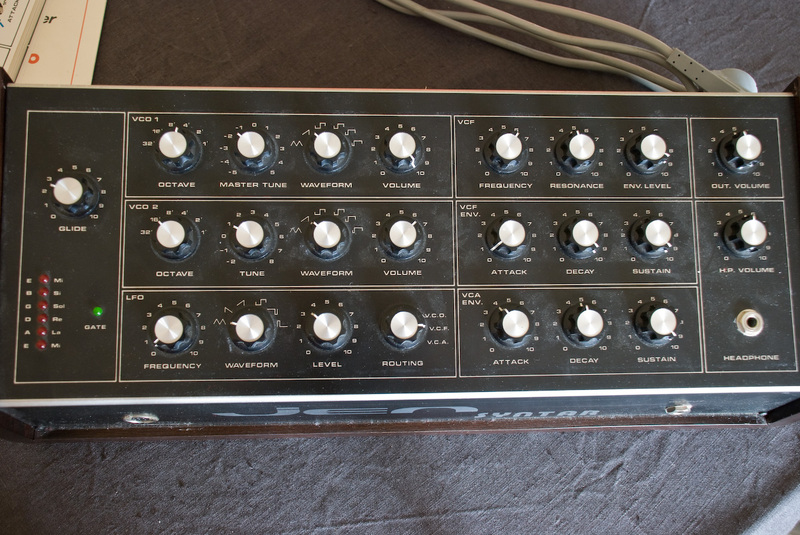 It has the basic signal-layout of the old moog. 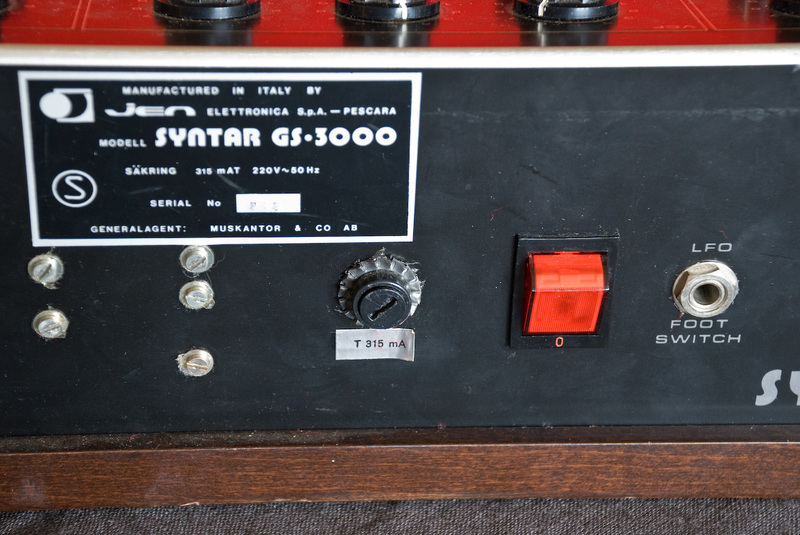 Instead of a keyboard there is an input socket on the front for connecting to a custom set of glue-on guitar pickups (no joke). To the left you can see it in all its glory. Synth, manual, pickup mics, and "presets". 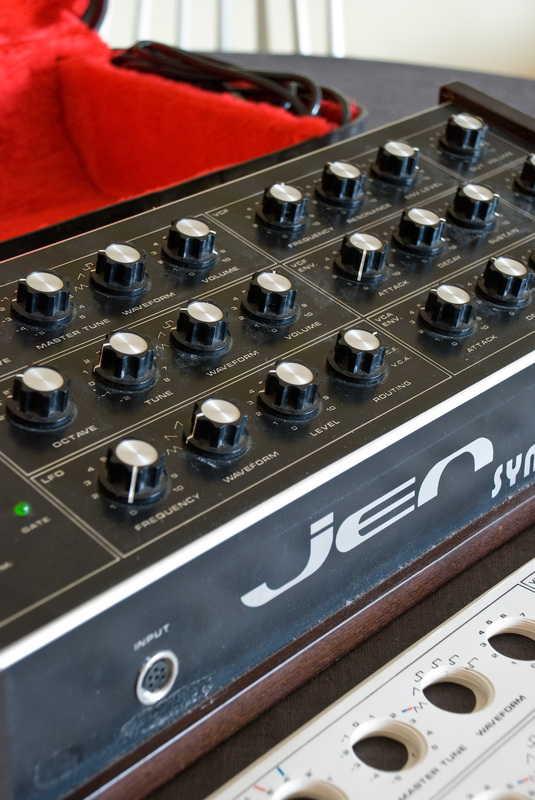 It is a simple but quite powerful mono-synth. Two VCOs capable of tri, saw and pulse/square waves. VCO2 is tuned relative to VCO1 for some fat detuning or those classic 5ths and 7ths. Sound is fed though a lowpass VCF (24dB/oct?) before reaching the VCA. VCA and VCF have independent envelopes of the atypical ADS variety (no release). There is also an LFO and Glide control. At the risk of hurting a potential E-Bay price, I have made it my new pet-project to try to fit some CV and Gate sockets. Only problem is... where? 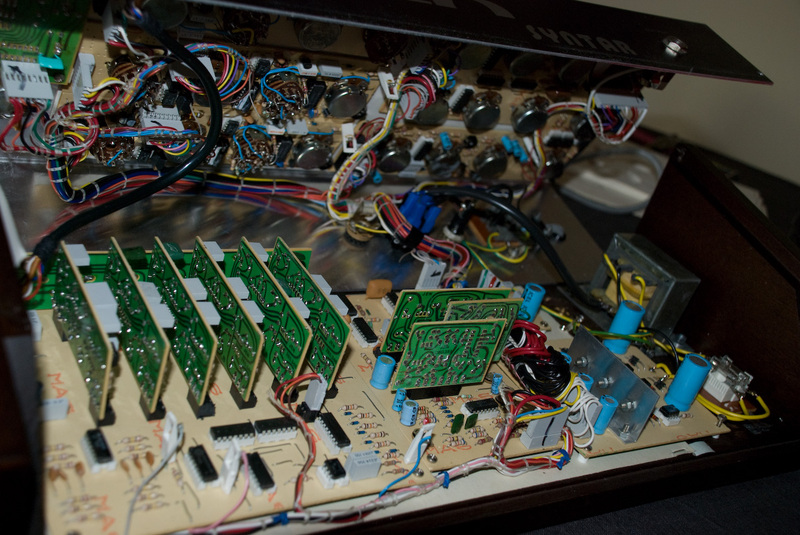 Since the synth normally analyzes the vibrations from guitar-strings I imagine it internally converts those into a CV voltage and gates for the filter and amp. • Black wires are used as ground (whatever it's called). • The blue wire (bottom middle) is the CV. • Strangely both the grey and pink wires (bottom left) affects the gating. • The pink is the principal gate while the grey affects the filter (in an odd way). • The red, orange and brown wires (bottom mid-left) simply drive some leds. 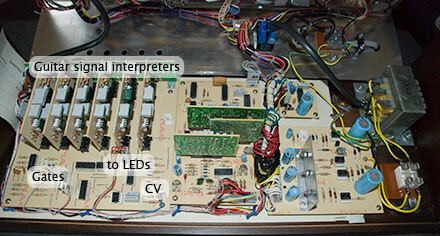 • The section on the bottom-left (the six identical vertical boards) is the "guitar interpreter". • The section next to it (the three vertical boards) has something to do with the waveform generation. • I am in way over my head! The next step is to buy a MIDI-CV/Gate interface and try some hot-wiring of the prime suspects. © Martin Westin, all wrongs reversed.